Location: Go east on Flamingo, turn right on Paradise (corner where Terribles is) go one block on right hand side. This is still in walking distance of the strip if you are a good walker. This is a Luxury Hotel and Casino and caters to the Who's Who and the very Young Crowd. You may not appreciate the choice of music played in the Casino if You don't like what the younger People listen to. On Thursday, Friday and Saturday night its a parade of Young People wanting to be seen, not gambling, just walking to be seen. In the warmer months do not go on Sunday if You are older than 30, Sunday is ReHab at the Pool and its very wild. Rehab is a drunkfest at the pool and that group falls into the Casino later in the day. For People under 30 its a great time but if You are over 30 You will be very much out of place. Hard Rock Casino Sports book: Very nice modern sports book. Seats fill fast so get there early. All the best digital betting boards and viewing screens. 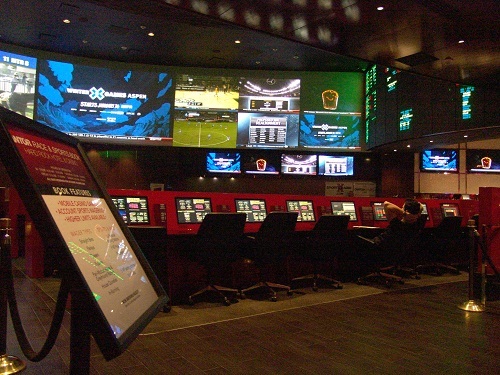 This sports book features Contour gaming devices so that You can bet from anywhere in the Casino. All the popular Slots, Video Poker, Keno machines, Penny slots, Mini Baccarat, Black Jack, Casino War, 3 card Poker, Big six, Let it Ride, Poker Room(12 tables, a few Lcd tv’s), Pai Gow poker, Roulette, Craps, Progressive Slots. Cocktail Service: very good, maybe too good, I had 3 drinks in front of me all night. Restrooms: Modern and very clean. Hard Rock Casino Overall Atmosphere: very nice, very classy. Its worth the short walk from the strip or you can take a cheap cab from Ballys or Bills gambling hall.